It is said by at least one Gottula family history that "the" Gottula family bible was loaned to the Table Rock Historical Society. Bibles have been consolidated to the museum at St. John's Catholic Church, which became a museum in 1970. 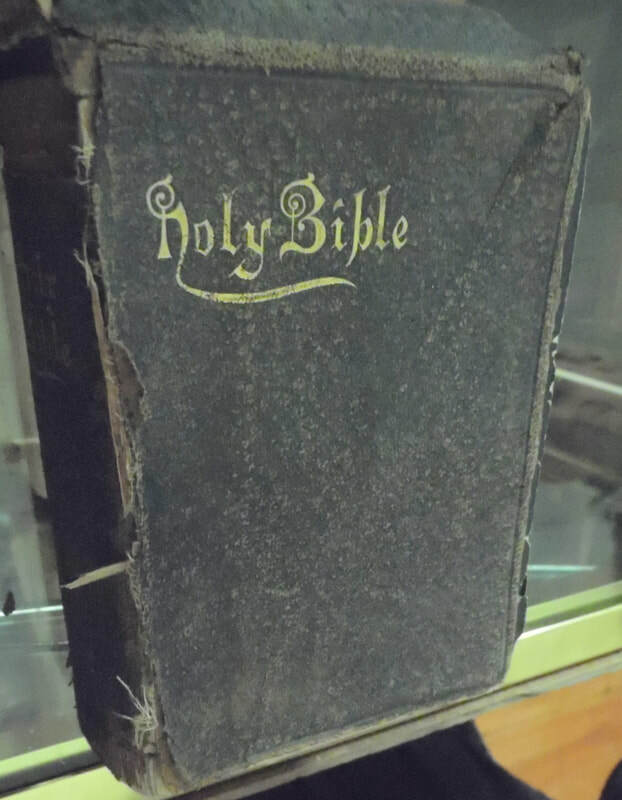 The only bible found as of January 2019 has been a bible donated by Esther Damm Gottula of Table Rock. It does not contain any family information and an inventory tag reflects that it was donated and originally placed in the Opera House. 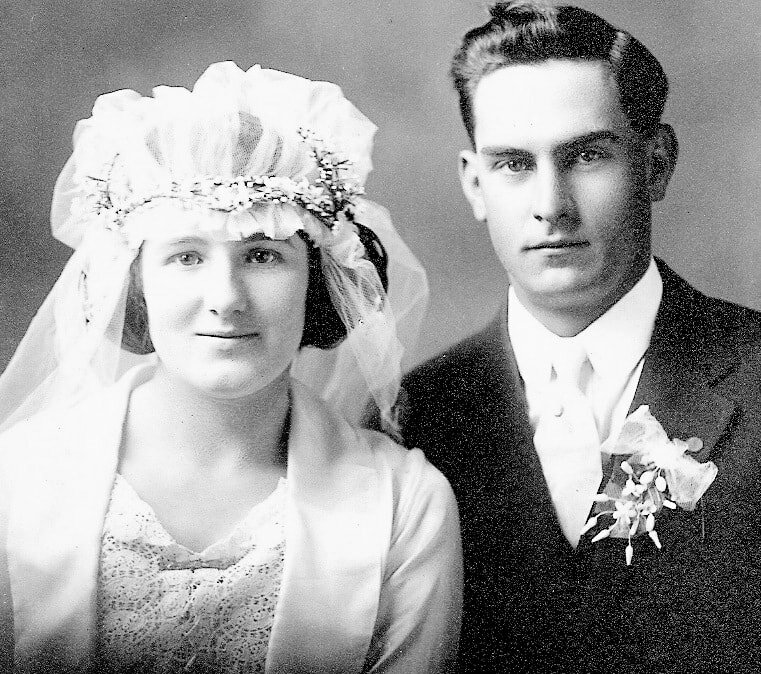 Esther's parents were Andrew and Christina Hergenroeder Damm and her husband Albert's parents were John and Charlotte Gottula. John's parents were Ludvig and Maria Gottula. Presumably, "the" Gottula bible refers to one owned by John and Charlotte Gottula or Ludvig and Maria Gottula. 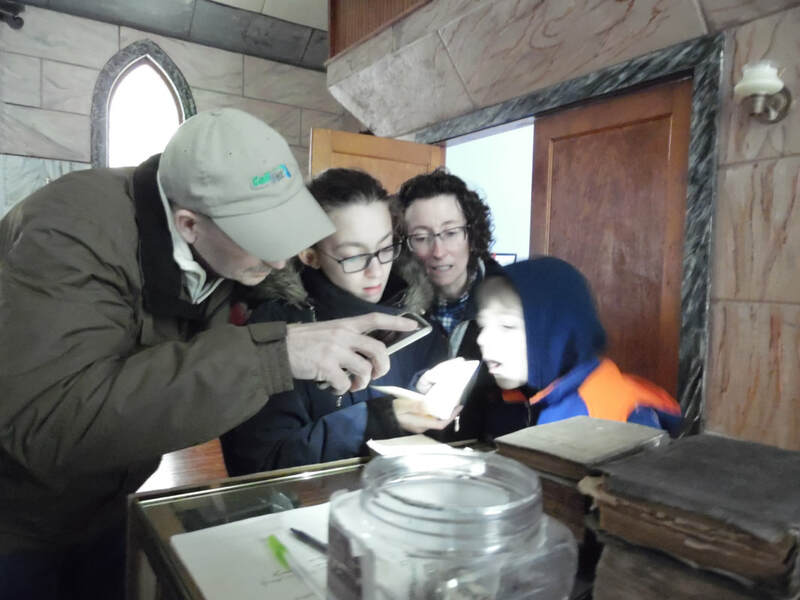 The Historical Society's collection has been carefully gone over three times in the past few years by Gottula descendants, with no luck. Where is it? It may be that the bible was donated before St. John's became a museum and may yet be found in one of the many nooks and crannies at the Opera House. In earlier times, loaned items were sometimes removed without permission or returned to relatives on request without retainining a record. The more recent policy has been that any transfer of items must be approved by the Historical Society's Board of Directors and recorded in the minutes, and that no item will be relinquished to any descendant without the express permission of the oldest level of descendants. The Wallpe family of Cordsville, Indiana, examines the inscription of a bible donated by Esther Damm Gottula. They are Ed and Glenda Wallpe with children Kalin and Miles. Thirteen-year-old Kalin found the inscription. Here, Ed tries to bring out the text with his cell phone light. With experimentation, he was able to shine it just right so that a photograph could be taken,. .Photo 6877, January 2019. Whose bible is this? The inscription says it was a gift from "father and mother" on Christmas Day, 1892. 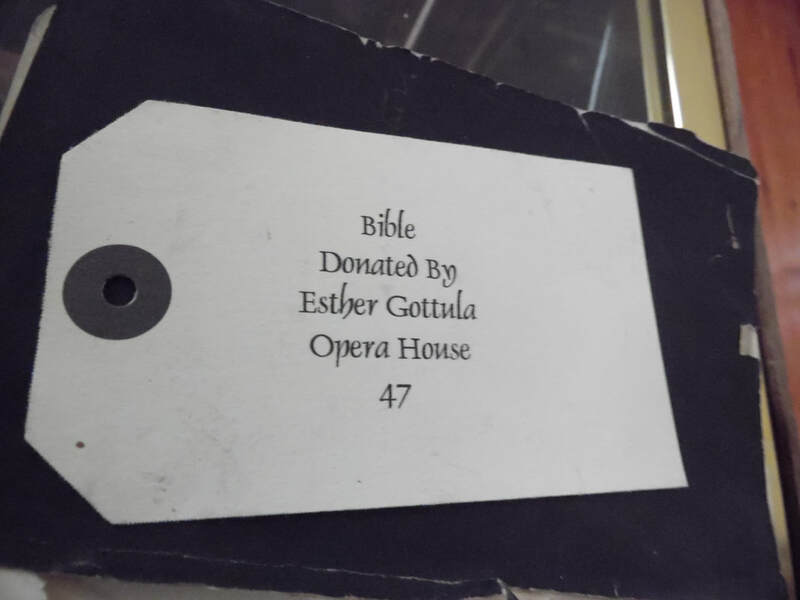 An inventory tag says that the bible was donated by Esther Gottula. Esther was not born until 1899, and her maiden name was Damm. She was a Gottula only by marriage to Albert Gottula (1896-1969), and he was born after 1892 also. Was it a family bible? Whose family? In the end, it is a mystery. But it is a bible that was a Christmas gift 128 years before the Kalina family looked at it. This inscription is very low contrast and can only be seen by tilting the book and finding the reflection of the letters. It reads: "A Christmas Present from Father and Mother, December 25, 1892." ​There is no other handwriting in the book,nor any personal items. she donated a bible with an inscription dated 1892. she married 30 years after the inscription date of the bible, It1892. it could not have belonged to either of them. albert was not born until 1896 and she was not born until 1899. Photo 7335, Esther Damm and John Gottula's wedding picture. Esther and John Gottula's 40th wedding anniversary Photo 7339, shared by grandson Russ Hunzeker. did the bible donated by esther belong to one of these five older siblings of albert, who were aged ages 5 to 12 in 1892? 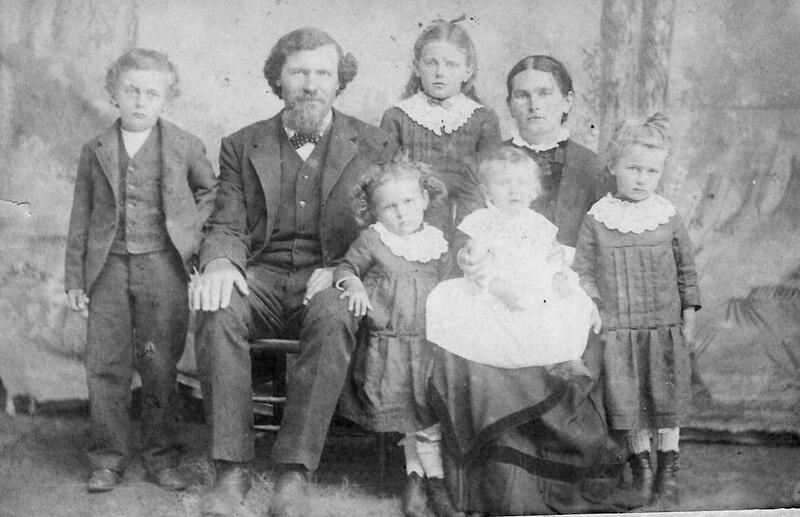 "Father and Mother," who gave Esther the bible: John and Charlotte Gottula, Esther's parents, with their oldest children. Shared by Russ Hunzeker.